On Sunday, Olympic champion Usain Bolt regained his 100m world title with a season's best of 9.77 seconds at the World Athletics Championships in Moscow. 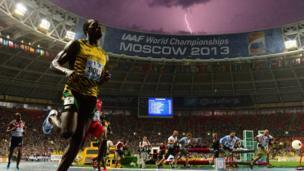 In this picture, taken by remote-controlled camera, he is seen at the finish line as a bolt of lightning strikes in the background. 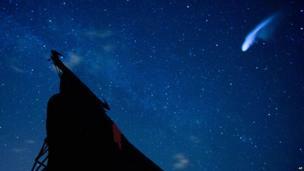 The annual Perseid meteor shower is seen over central Spain, as the Earth hits a belt of comet debris. 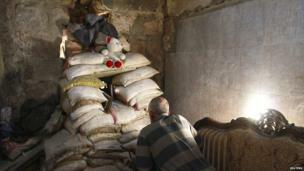 A Free Syrian Army fighter takes position behind sandbags inside a room in al-Jdeideh neighbourhood in the old city of Aleppo. Syrian rebels hold parts of several major Syrian cities, including Aleppo. 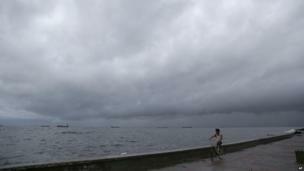 A powerful typhoon, Utor, has hit the northern Philippines, leaving one person dead and several fishermen missing. It was expected to remain there for most of Monday before sweeping out to sea. 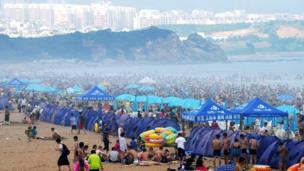 People flock to a beach in Qingdao, in eastern China's Shandong province, to cool off as China's record-setting summer heatwave continues this week with temperatures pushing above 40C (104F). A group of supporters of Egypt's ousted President Mohammed Morsi train for security duties near a sandbag barricade in Nasser City, Cairo, where they have installed one of their protest camps. 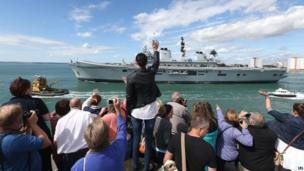 Crowds watch as the helicopter carrier HMS Illustrious leaves Portsmouth in the UK. It is part of a Mediterranean-bound fleet, part of which will be stopping off in Gibraltar, a British territory, at a time of increased tensions with Spain over border checks. 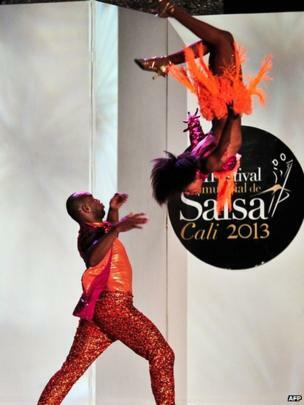 Salsa dancers take part in the 8th World Salsa Festival in Cali, Colombia.